Here we have a almost complete BIC BU3 pen collection. On the left we start with a BU1 because I had no other place to put it. We start the BU3s with seven extra fine ball point pens. Followed by a black clear fine point BU3. Then we have three 0.5mm grip BU3s. Last are seven 0.7mm BU3 grip pens. Add them all to your collection. Now for the Christmas Give away. Winner number one is D Moon. Winner number two is PenGirl. Please email me at moose@hot.rr.com with address and which BIC pen 4 way pair you would like.Thanks to all who entered. Here we have two new Parker pens. The one on the left is a Jotter with the old style calender. The calender Jotter came out in 1966 but I do not remember seeing the calender on any recent Jotters. The calender works fine and it would be nice to see this model sold here in the USA. The pen on the right is a Parker Beta. This pen uses the Parker Jotter refill and is made of very light plastic. I do not see this one catching on here in the US. It looks nice but is not well constructed. Luxor Writing Instruments under licence from the Parker Pen company makes and sells these pens in India and Nepal. Both are nice examples of Parker pens being made in India and sold to their citizens. Add them both to your collection. Running out of days to get in on the Christmas give away. Here we have more items just added to the collection. Top left is a vintage cast iron note holder spike. Maybe from the 40s. They were very popular in their day. Next is a Sterling Plastic eraserpet item number #637. Unlike 99% of Sterling Plastic items that are made in the USA this item was made in Japan. Then we have the Empire Snappy Pencils. Late 60s or early 70s. Don't remember this packaging but this one is in great shape. At the bottom is a very nice Artista water colors. Made by the Binney & Smith Inc. New York. This one holds 8 colors and I do remember using something like this in school. Box is in great shape. Then we have the Ruby Chisel Point Eraser display by Eberhard Faber. I placed the ruler below it so you can see how small this display is. I would guess you get five erasers for .10 cents and it is in great condition. Add all these great items to your collection. Don't forget to leave a comment for our Christmas give away. Great items are being added daily. I rushed through my last post on Pentel Teckniclick pencils because I am going to give one away. There will be two winners. The first winner will get to pick which BIC 4 way package they want. BICs on the left are metallic purple and pink and the package on the right are BIC metallic blue and silver. First winner also gets the rare white Pentel Teckniclick PD105C-W pencil. It is the only solid color Teckniclick that I have seen. Both first and second place winners will also get some other items. All you have to do is sign on as a follower and leave a comment by 28 November 2013. State side only on this one. This is the only give away I will do this year so I plan on making it a big one. This is my current collection of these great pentel pencils. The back row has 24 different pencils with 12 more pencils in the front. The two new pencils I just added are the orange PD105C-F and the solid white PD105C-W in the front row. Back row starting on the left are the PD105RDs plus the 07s, next are the PD105Ts plus the 07s, then the three PD265s with scented lead, last are the Teckniclick 2s PD235T plus the 07s. Front left are the Teckniclick Gs PD305T plus the 07s and the orange PD105C-F. On the right front is the solid white PD105C-W followed by the Teckniclick T3s PD245s plus 07s for a total od 36 different pencils. The two new ones are from Thailand so there are more out there. Add all these great pencils to your collection. We are talking about the ten regular blue ink BICs in the middle. Someone decided to take different color para cord and place it inside the BIC barrel to produce these ten different color BIC pens. I have used para cord for years to make lanyards for knives but never for the inside of BIC pens. If you would like a set of these pens you can contact the maker at gateman42@hotmail.com. Add them to your collection. Don't know much about this one. I would bet from the 70s maybe but could be older. The sharpener has three distinctly different taper lengths. This sharpener has a handy desk stand to place it in or you can just put it in your pencil case or pocket. This item was sent to me from the great people over at Mad Men. Add one to your collection. It has been some time since we could say that something new was coming to our stores from BIC. Five new BIC 4 way pens. The picture only has four and it is the silver green that I am missing. In the picture is the silver purple, silver pink, silver blue and the silver gray. As I said I am missing the silver green. These new ones are all made in France. I already have the BIC 2 way in most of these colors but I did not know that we would be getting new 4 ways and just in time for the holidays. Add them all to your collection. NEW METALIC BIC 4 WAYS ARE NOW AT STAPLES!!! I do wish I had this display. I currently only have one carded Twiggy pen and they are not cheap. I don't know if someone owns this display or it is just a picture from the past but it is a nice example of a 60s counter top display. 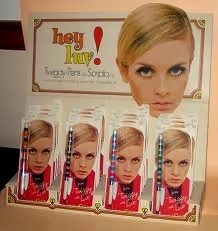 If you can find a Twiggy pen add it to your collection. They are very easy to refill so if you can find one you can start using it.